Jabez Corner is on Sandwich Street about a mile south of the center of Plymouth, Massachusetts. It is the heart of Plymouth's oldest separate neighborhood, mentioned in the colonial records as variously as "the Little Town," "Wellingsley," and "Hobshole." The origin of these names has been lost. "Hobshole" - a name used as early as 1623 for the salt marsh and the brook that flows into it - marks the northern border of the neighborhood. It may refer to either the knobby tussocks in the marsh or perhaps someone named Robert - "Hob" being an old nickname for Robert. Robert Bartlett and Robert Ratliffe both had land south of Hobshole brook in 1623. It has also been suggested that the name might derive from Pilgrim's friend Hobbamock, but he never lived near the area as far as we know. There has been speculation that "Wellingsley," which was first mentioned in 1639, might derive from a hamlet called "Wellingley" in England near Scrooby on the Yorkshire-Nottinghamshire border where the Bradford and Morton families originated. Gov. Bradford's great-grandfather "Robert Bradfourth, of Wellingley, Tickhill, York, England" (c. 1487 - 1552 or 1553) came from there, and his nephew, Nathaniel Morton, later settled on the north side of Hobshole or Wellingsley Brook. Jabez Corner was just inside the southern boundary of the first "mile and a half" division of Pilgrim farm land in 1623. It got its name later from Jabez Churchill, who lived on the old Churchill farm at Wellingsley in the late 18th century. The corner marks an abrupt westerly turn of Sandwich Street away from the shore following the old Indian trail to Manomet and Cape Cod. What is today Warren Avenue was just a cart path for that farm before 1850. If someone had tried to cross the Churchill farm to the south on a disused colonial track, they would have encountered an obstacle at Cobb's Hollow, where a brook flows into the salt marsh at "Povery Point." Further along past "Manter's Point," they would have had to cross Fuller's Brook and a second salt marsh before encountering the wide swampy basin which marks the outlet of Eel River. These difficulties had convinced the inhabitants to abandon the shore route go inland as their native predecessors had. The old road to the town of Sandwich on Cape Cod which turned at Jabez Corner crossed Eel River at a narrow ford on the west side of the basin and continued south between the high Pine Hills on the east and the cedar swamps on the west. The Churchill family arrived in the neighborhood as early as 1643 when John Churchill settled east of Sandwich Street. A house owned by Churchill when he died in 168- still stands on the east side of the street at the point where Sandwich Street turns south after the corner (identified as "F. Morton" on the map). Another old Churchill house was located in the sunken yard of 222 Sandwich Street before 1897 (identified as "Shop" at the upper end of the box marking Jabez Corner). Plymouth historian William T. Davis ventures that this may have been the site of the first Churchill farmstead. Harvey Bartlett's store was originally built by Jabez Churchill. The adjoining property to the north (incorrectly identified as "N." rather than "H." Bartlett on the map) was sold to Harvey's father, Ansel, in 1808 with an old mid-17th century house built by John Rickard. In 1837, Jabez Churchill, Jr., sold Harvey a lot with the shop which became the store shown in the picture. He retained the corner lot itself, which was sold by his son in 1871 to the Town of Plymouth for the new Wellingsley schoolhouse (the corner of which can be seen just to the left of the open door), and a second shop on the south side of Sandwich St. 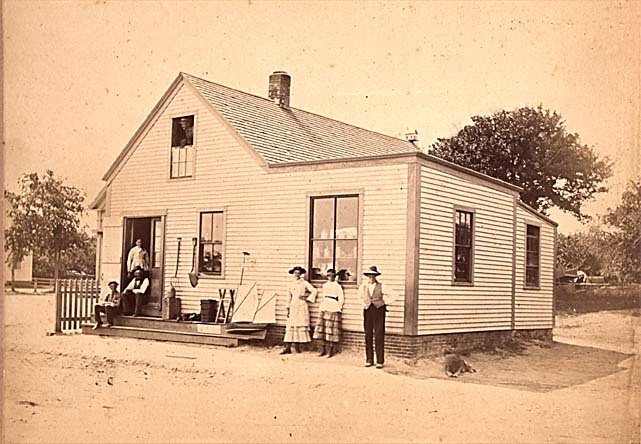 This picture, which was taken about 1875, shows the store with the addition added by Harvey, whose wife Nancy standing in the doorway. One of their sons, Ansel, is seated on the steps, while another, Harvey, Jr., is looking out of the upper window. The young people are unidentified.